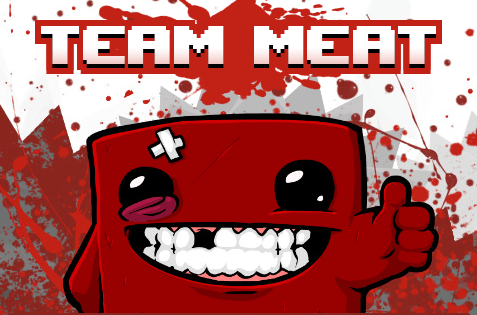 SUPER MEAT BOY Coming out soon! For those of you who missed the epic platformer flash game MEAT BOY you should click one of those links and check it out right now. Super Meat Boy is a game where you play as a boy without skin whos girlfriend who is made of bandages gets kidnapped by a fetus in a tuxedo wearing a top hat and a monocle. Super Meat Boy features platforming madness spanning over 300 levels of saws, disease, fire, lasers, missiles, and various other traps that Meat Boy must avoid to rescue is lady love. Right? who couldn’t love that? The flash version is super fun and deliciously meaty, so I’m super stoked to heave my credit card at my TV to get SUPER MEAT BOY when it’s out! Question: When is this coming out on PS3? Question: Why should I pay for this? Its free on Newgrounds! Answer: It’s not the same game idiot, die in a carpet fire. Question: Where is the level editor? It’s a big day for me, my original song “Run to Japan” that I recorded at Moving Box Studios just got licensed to Armor Games. Last year, I wrote a fun little asian-inspired song called “Run to Japan”. I recorded it at Moving Box Studios, I hadn’t written music in a while and needed a break from the other studio works I should have probably been doing. I posted it to Newgrounds, the online flash community, and let it be. It was a fun and kind of dorky little beat, I figured someone would probably dig it. I couldn’t help but imagine animation going along with it, the song structure is progressive and it felt like taking a train into a jungle and then running into a japanese city.